This class will be an introduction into how to brew using All-Grain. Tim Durning will teach the steps of All-Grain brewing, including grain selection, mashing, recirculating, sparging, and more. You will actively participate in the art of homebrewing while learning the essentials to brewing a 5 gallon batch using All-Grain. This class at has limited space, so reserve early. 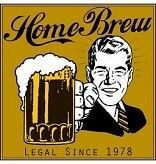 The class at Philly Homebrew Outlet West will start promptly at 11 AM and likely finish at 4 on the last Sunday of the month. The cost for this class is $70 and includes lunch and homebrew samples to taste during the lessons.